To assess seismic hazards associated with active anticlines along the deformation front in western Taiwan, it requires deep understanding of the formation of those anticlines. We intend to make use of abundant geodetic, geologic and geophysical data in western Taiwan and integrate with physical models to explore the possible mechanisms which control the development of the anticlines. A number of researchers have demonstrated that the appearance of bed-parallel slip during the process of folding would dramatically affects fold forms (e.g. Niňo et al. [1998, JGS]; Huang (myself) and Johnson, [2009; 2016]). Furthermore, evidences for bedding parallel slip are ubiquitous in the folded sedimentary rocks. However, previous studies related to natural fault-related anticlines seldom incorporated such a mechanism into their analyses in a mechanical way. 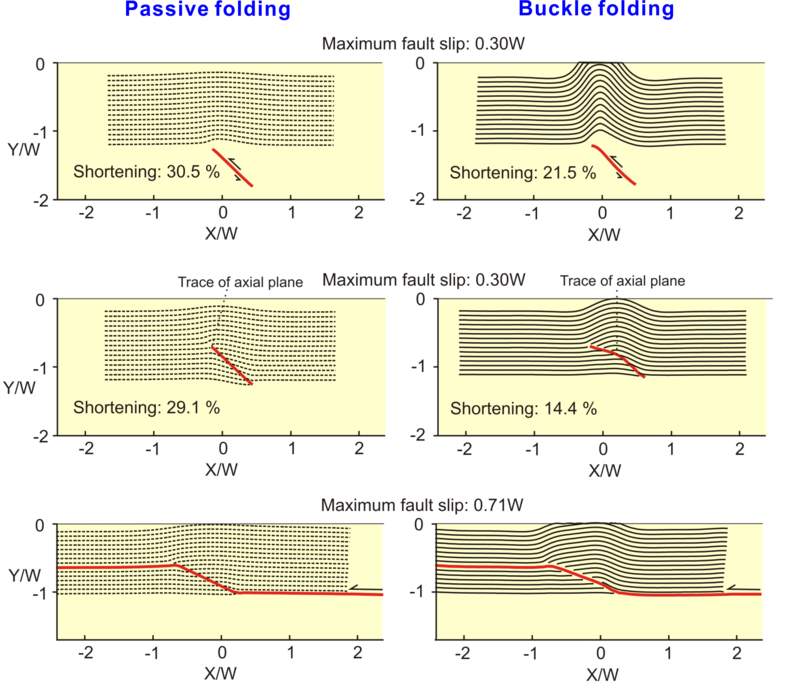 Huang (myself) and Johnson [2009; 2016] further demonstrated that several kinds of fault-related fold forms can be significantly influenced by fault geometry, properties of layer contacts, and loading conditions. Figure 1 shows end members of fault-related folds for the properties of layer contacts. Layer contacts are cohesionless and frictionless for buckle folding (i.e. beds slide freely) and layer contacts are bounded for passive folding. The difference between them is distinct. Figure 2 shows the effect of extent of bed-parallel slip on fold from. The amplitude of folds produced in a medium containing a fault and elastic layers with free slip and subjected to layer-parallel shortening can grow to more than twice the amplitude of folds produced in homogeneous media without mechanical layering under the same amount of shortening. In addition, the wavelengths of folds produced by the combined mechanisms of fault slip and buckling may be narrower than folds produced by fault slip in an elastic half space by a factor of two. Therefore, studies that assume folds grow solely by slip on a fault in an elastic half space may significantly overestimate fault slip. The target of this ongoing project is those active folds along the deformation front in western Taiwan. The goal of this project is to answer the following questions: 1) what mechanism or mechanisms are involved in the formation of an anticline? 2) Is there a significant difference between shorting rate estimated from previous kinematic model or analogy models and the one from our mechanical models? 3) Could a mechanical model produce a similar fold from and surficial deformation like recent geodetic measurements? 4) How deep is the upper tip of the underlying fault? 5) Does the propagation of the underlying fault affect the development of fold form? Figure 1. Fault-cored folds. Folds at right are formed by buckle folding (layers slip freely at contacts). Folds at left are formed by passive folding (layers are passive markers). W is initial fault width or ramp width. Fault dips 25° at onset. Figure 2. Models of a fault embedded in stacks of mechanical layers with different layer thicknesses. 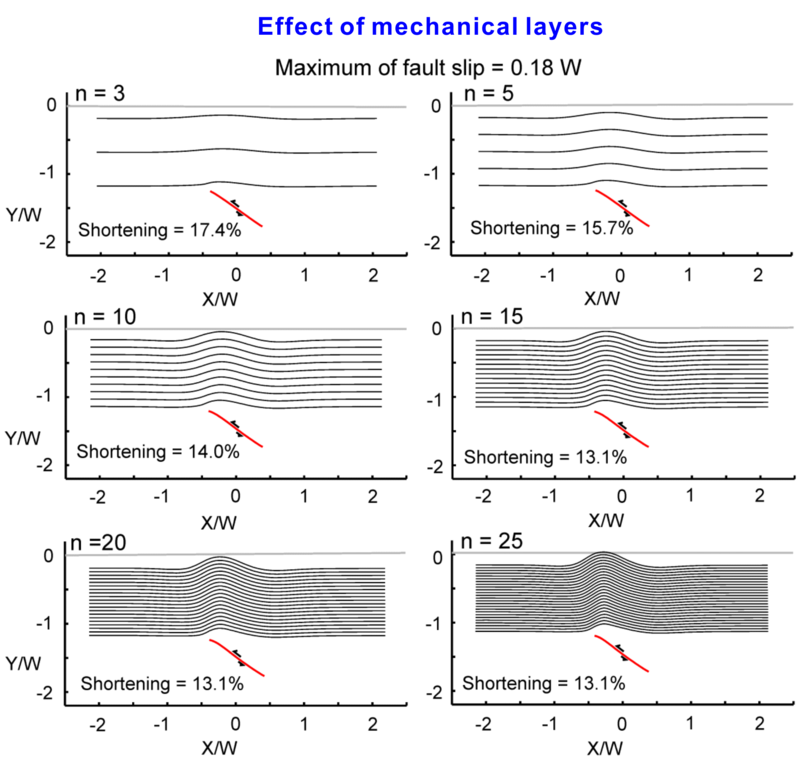 The faults in all models have the same maximum fault slip of 0.18 W. W is initial fault width. 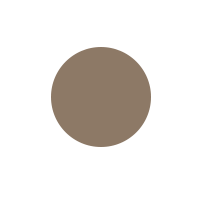 n is number of layer interfaces.